This is my second post today. For my Tickling Tuesday post please scroll down! Yeah, it's time for the new Newton's Nook Designs Release! The new stamp sets are available for purchase in the Newton's Nook Designs shop on friday. Today we are showcasing the new set Spring Showers - this is cool for so many occasions! Would you like to win Spring Showers? Comment on the NND blog and Design Team and Guest blogs (see list below)! Two winners will be chosen at random from the collective blogs release posts. Make sure to check out each of their blogs and comment for your chance to win. You will not know which blog has been chosen so the more you comment on the better your chances are of winning! You have until Thursday, March 20th at 9 pm Central Standard Time to comment -- winners will be announced on the blog post on Friday, March 21st. Love that grid side border, and how about that duckie....SO sweet!! Love the polka dot umbrella and boots! They really stand out! Darling red boots and umbrella! So excited to be a Guest DT with you this month! Adorable design and easy to recreate, thanks. Very cute with the matching umbrella and boots. I just love the red contrast wit all the other soft colors, Christine! How cute is your polka-dot umbrella and sweet duck, sporting rubber boots! So darling!! Stunninge card Christine, I know I will love any card you make with this sweet image. Your coloring is stellar once again!! So cute--love the matching boots and umbrella! Oh so fun! The red rain boots...I want a pair! I love how the red draws your attention to the cute duck. Wonderful card! Such a simple and cute card! I love the duck! 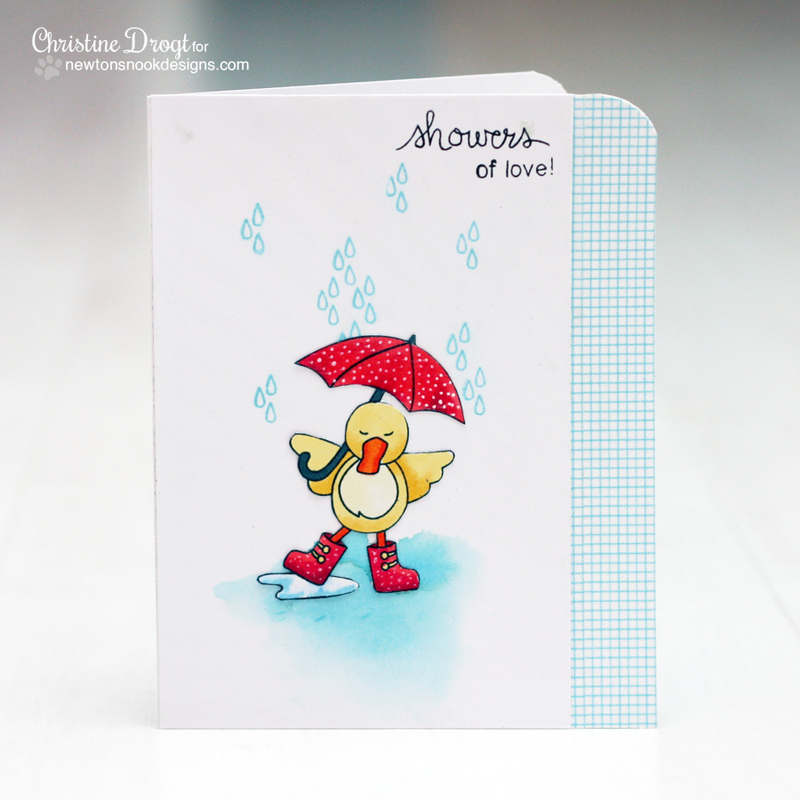 This ducky is having so much fun splashing in the puddle with those adorable red rainboots!!! Such a darling card!!! Perfect, as usual!!! This card is wonderful! Love the raindrops and the pops of red!! And the blue on the edge is just lovely!! Very sweet! I love the blue checker border and rounded corners! Such a very sweet and cute card!! This is a cute stamp set - I like how you've used it. This is the PERFECT card for kids. LOVE it! This is so pretty - love the big blue water by his feet! Such a cute card! I love the red umbrella!! Very nice card...love you used of white space and the checkered blue strip down the side.